May Los Realejos photos help you getting around driving or even walking. Let me share Los Realejos photos with slightly overcast skies until I may capture better images. The birds eye views are meant to be an alternative to satellite projections. Discover landmarks by enlarging some pictures to help you get around in a 57,09 square km municipality with Puerto de la Cruz and La Orotava coming up on some as extra orientation points. The following Wikipedia only shows 20 villages without Rambla del Mar by El Guindaste and other important ones in my mind. Romantica-1 and 2 with Los Potreros of Longuera or San Agustin of Main Realejos can only be seen by enlarging the Google map below. The distance from the capital Santa Cruz is roughly 42km. By the way, clicking on the photo below will lead you to real beautiful bird eye views of Realejos and Puerto de la Cruz, although mostly in partial form. But please, come back here afterwards. La Vera A somewhat confusing fact is that Southeast La Vera belongs to Orotava, its Southwest to Realejos and the rest to Puerto de la Cruz. La Vera Las Arenas adjoins Mount Aguilas and Mount Monasterio Montaneta of the village La Montañeta Realejo. By the way, the La Villa Alcampo Leroy Merlin traffic circle is to the left and behind the Monasterio. This means, you will have to turn off the freeway TF5 exactly there. Or take the first turn to the right in central La Vera village. 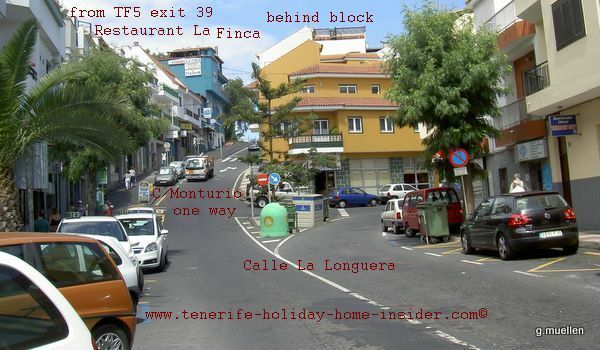 The photo will help all those, who struggled to find the Monastry theme park with nature reserve and many restaurants. 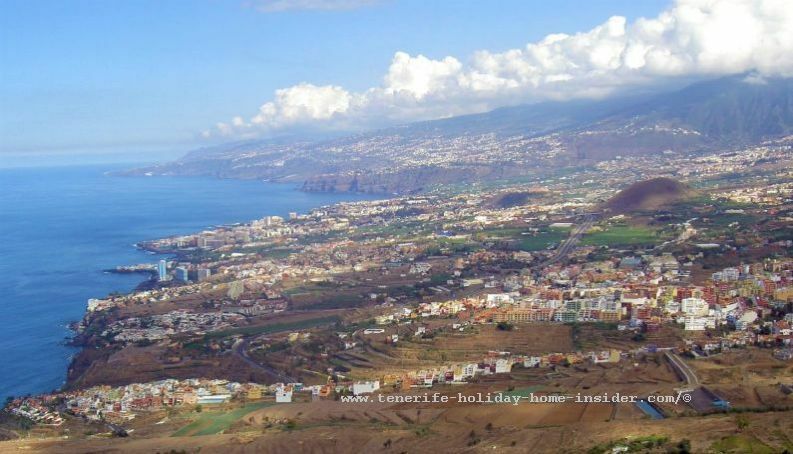 Let your eyes move to the Orotava Bay the Rincon de la Orotava in Spanish. 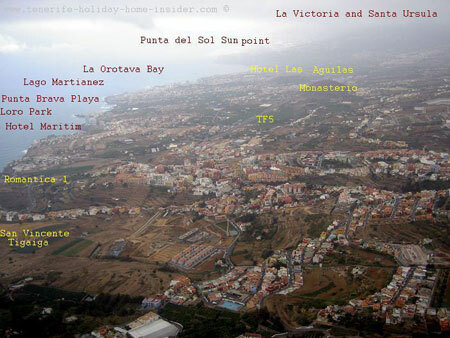 Enlarge the Orotava Valley "photo map" with yellow marked details, dark green banana plantations, vegetable patches or recreational areas in between concrete jungles of a combined population of 108 999, about half of that of the Tenerife capital as per census of 2007. La Orotava with 40 644, Realejos with 37 224 and Puerto de la Cruz with 31 131. Then, many emigrated due to Recession. The blue, coastal sky scraper Hotel Maritim marks the border of Realejos and Puerto Cruz. Drive up the steep hill from there on the Longuera road. Its bypass the F316 by the Lidl Longuera with traffic circle was inaugurated in 2012. The Longuera long mile road leads to all sections of Los Realejos. 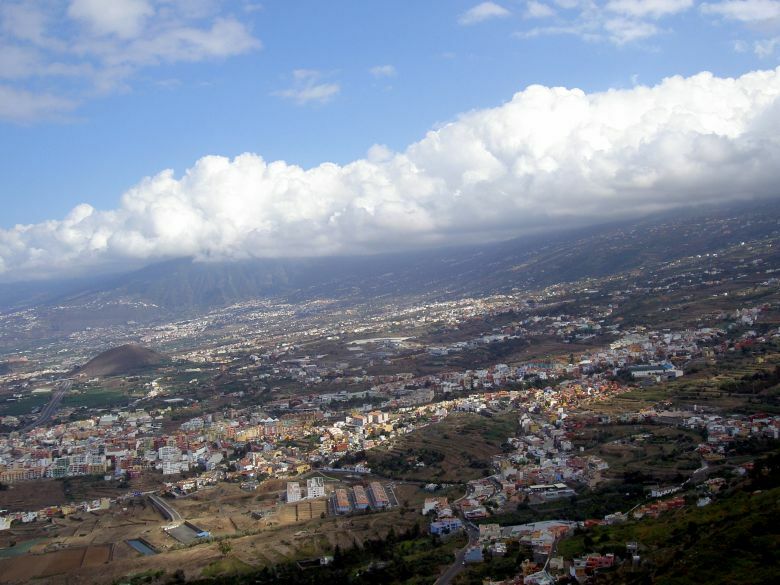 The entire municipality of La Orotava with mountain villages, such as Aguamansa Orotava or Palo Alto and Cruz Santa of Realejos are not shown. Los Realejos Alto commercial center with land terraces for vegetable planting in the Gorge Godinez. Realejo Bajo and Tigaiga in the foreground are not so close in reality, as the ravine is much deeper and wider. Many Guanche caves were in this section before the Tenerife conquest by the royal Castilian troops called the Realejos that stationed on the upper mountain slopes. It takes 15 minutes by car and half an hour of romantic walking from Hotel Hotel Maritim to Hotel Los Roque. Only a glimpse of the scenic settlement of Romantica 1 on terraces can be made out. Depicted is the rural charm of a small Tenerife town a mere climbing road but, one of the richest for its Spanish traditions of religious festivals. It's easy to walk from its hill to Upper Los Realejos when it's cordoned off to all traffic. Tropicana has many a holiday home in Tenerife of private owners. The multi million project was already in the pipeline in 1997 and took years to materialize. Drive along the Longuera road all the way to the traffic circle below San Agustin Los Realejos Alto. Then, climb to mountain regions you can trace on the Google map above or follow the TF5 alternatively in Western or Eastern directions. We foreigners often incorrectly call Longuera Toscal Realejos Bajo, as Realejo Bajo is the historical Realejos a hamlet from way back where the conqueror the Adelantado had the island's first Tenerife finca a Hacienda.